dejiolaluweblog: Issue:Lagos to Minna by Rail: The Good, The Bad, The ugly. Issue:Lagos to Minna by Rail: The Good, The Bad, The ugly. I had my first travel on steel wheels in the late eighties as a teenager from Abeokuta to Lagos when I think Nigeria hasn’t lost all of her innocence. It was during one of those long holidays back then. And I could remember the trip was memorably glitches free and excitement packed as well. Now I can’t recollect where exactly I went or disembarked but I know I went to spend my holiday with beloveds from my maternal side. I also had pocket of experiences commuting by rail in the early nineties shuttling from Ikeja and Ikoyi in Lagos on a daily basis working at a now defunct AP gas station managed by an in-law, blessed his soul in ascent. The most recent, however was between 2012 and 2014 as a student of the National Open University of Nigeria and it was In the bid to cut down on associated stress that comes with going for examination because I then lived somewhere in Ogun State. The experience was nowhere comparable to what I had seen in time past. I can say with a deep sense of responsibility it is progressively deplorable. All I can recollect were the regular stampedes trying to get on board or disembarking from the coaches by people at the designated rail stations, the filthy and overcrowded coaches, torn chairs with people crammed into available spaces which include toilets, aisle, and dangerously hanging by the tail boards and the likes, the suffocated and fainted babes and their apprehensive mothers, concerned co-travellers contriving to revive them with sachet waters and hand fans. During this period, I had seen on a couple of occasions touring train with it mixture of cozy first class coaches beautifully curtained and fitted with flat screen digital TV, which curiously were all gone now and other conveniences and endless stretch of second class coaches and I was intrigued. And I had said to myself that one of these days I would love to travel by rail to a distance place. The opportunity finally came on Friday, 9th Nov. 2018 after months of delays and postponements. I was to travel to Abuja as matter of existential necessity out of several options. What really gave impetus to the choice of travelling by train was the growing fear of the death traps Nigerian roads have become overtime. Ordinarily, I purposed it to be an excursion of sort so that I would be able to cope with any disappointment that may come up simply because you really cannot trust public corporations in Nigeria to consistently deliver on their core mandates at its were. It is no news that Nigeria has a plethora of failed public corporations from Nigerian Airways, Nigerian Shipping Line, and Nitel et all. It is that awful. 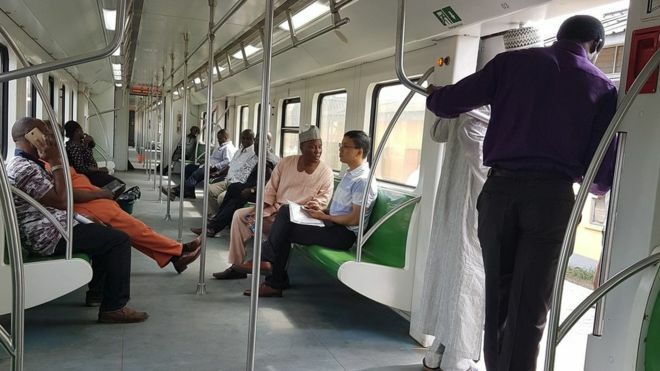 Pix of Abuja Light Rail during Commissioning. The journey took off a little behind schedule if information I gathered from official quarters on earlier enquiry was anything to go by. The train which was said would arrive at 11.00am ended up arriving at 1.00pm. As usual, we hurriedly boarded the train with a female voice warning us to be security conscious as miscreants might have invaded our midst. The station like any other perhaps must have had a history of passengers experiencing and reporting the loss of personal chattels while boarding trains on a regular basis. So, I think the verbal sensitization is a welcome development after all like they use to say ‘to before warn is to before harm’. However, there wasn’t anything of such at least from what I know. There was a disappointing incident of derailment at around 3.00pm some distance from the Itori station in Ogun State. And by the time NRC team of engineers arrived it was around 6.00pm. It took them close to two hours or thereabout to re-rail the affected coach by then it was exactly 8.10pm. But while the engineers labored to fix the problem, it occurred to me that there is an official position to cover up incident such as this. How did I know this? As a blogger, I was inclined to recording details of my travel experience with view to sharing it with my readers. I got the first shock when I tried to take pictures of the derailed train as well as well the engineers at work as I was abruptly stopped in my track by a spontaneous cacophony of voices who demanded I delete the pictures querying if I’m just travelling by train to have been surprised by incident of a derailment that to them has become commonplace. Next was what shocked me the most. This time another passenger not far from where I stand was caught recording a video of the on-goings and was caught in the act. And I could hear one of the security guards threatening to shoot the guy and he actually did draw on his service pistol. Then it dawn on me that it is an official position that anything that happens in the form of accident no matter how minor must be kept under wraps and out of media glare. At the end of the day, the journey recommences at around 9.00pm. But if you think we are done with similar experience you are damn wrong. The second and final disappointment. On the second day of a journey which I thought would take no more than hours there was a second derailment shortly after leaving Oshogbo station. This time it was the cargo coaches that derailed. But unlike what we saw in the first derailment, the officials decided otherwise to detach that section so they could come for it later instead of waiting by to get it fixed. This decision pleases many of us who thought in error that there would be no more delay. 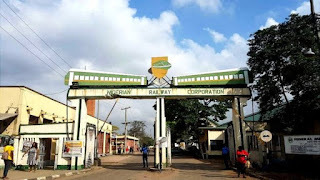 So, our next stop was at the Offa station in Kwara state. Again, the time was coincidentally 3.00pm like the first. But contrary to what most passengers had expected they were to go back with the carrier to pick the derailed cargo coaches after it might have been re-railed. But these activities took far longer time than anyone could ever have imagined. However, those who had expected as much decided otherwise to explore alternative option like continuing their journey by road. At least I know of two families who left in this manner. Their decision was further fuelled by a rather unconvincing response we got from the officials who we asked how long it would take to get the problem fixed. They were simply not sure and more so they their tacit support for plans by the women in question who to say the least had become frustrated with the incessant delays to explore alternative options. I saw off the women whose destination was Ilorin, the Kwara state capital. What a wise decision this proved to be in the long run because the carrier returned with the cargo coaches late and the journey started again Sunday, at exactly 12.44am the third day. I was brought back to consciousness from a short sleep by the sudden jerking movement of the train and I was duly consoled by the realization we on the move again. To my utter dismay at no point during these flurries of disappointing service delivery by Nigerian Railway Corporation from which a flagship world class customer oriented train service is expected was any apologies offered to the travellers. Everything seems to have been taken for granted. After spending three days travelling from Lagos to Minna treated to some shoddy and dodgy service by NRC management, the good thing finally was I made it safely to my ticketed destination as I disembarked at the Minna station en-route Abuja the FCT by road. The roads especially the one from Minna to Suleja was dusty and full of potholes and at different stages of repair works. These no doubt pose varying degree of dangers to the road users as drivers dangerously meander through poor visibility occasioned by successive cloud of dust and gullies that littered the road. Finally, my thoughts on the light rail. 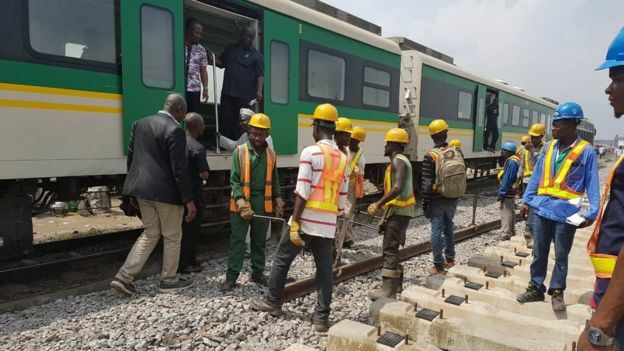 As Nigeria prepares to upgrade to the light rail in no distant future with the first phase from Lagos to Ibadan nearing completion, I’ve genuine fears for its sustainability if the same crop of heads who have routinely mismanaged the almost moribund standard rail we are about to phase out are to take over. I honestly feel if they are unable to profitably manage the old and analogue system, it is predictable enough they wouldn’t do any better with the digital. It is not about being pessimistic, it is about being realistic. Perhaps when completed the government plans to turn it over to the private sector for effective and sustainable management. If so, may be then we all can be hopeful for a better day ahead in the rail system which is universally adjudged by train enthusiasts to be the safest, reliable and most convenient way of travelling. As to whether I would still love to travel by rail in the coming days given my experience as captured in this narrative? I’d say that I’m still very much open to such if the roads remain the way they are at present more so if the trip is cross country. Opinion: Has Nigeria still got football talents?